How do you define success in the “job” of parenting? Mother of one, Leigh is a Ph.D. candidate in Tibetan Cultural Studies and works for Maitripa College as the administrative coordinator. Leigh Sangster: I see mirrored in my child’s face and behavior how my actions and attitudes have affected her, and reciprocally, I try to be a mirror to her of her own true goodness. When she is radiant with the knowledge that she is cherished, exploring confidently because she trusts we are supportive and attentive, well rested and reveling in wonderment, I feel like we are managing to give her a good foundation upon which she will be able to blossom as one who can be of so much benefit to a world in need of her. Carina Rumrill: Carina is parent to three homeschooled children ages seventeen, fifteen and three; holds a master’s degree in Gender and Cultural Studies; and is the managing editor for Mandala Publications. Carina Rumrill: There is a tension between looking at your children as they are appearing to you and trying to see what they are teaching you about your own mind and your own path. When I realized that children have their own karma (which is, of course, a projection of my karma), their own imprints, their own tendencies and obstacles to overcome, this was a huge step toward my ability to parent “successfully.” Sure, you can measure some of your success as a parent by checking if the child is developing a good heart, an open mind, a kind nature, a helpful attitude; but I measure my success at parenting by looking at my own mind, my own practice. How open am I when my kids need something; how engaged am I when they communicate with me; what is my level of patience when they are behaving in ways I wish they wouldn’t; how authentically do I serve them? This is the real measure. There are parents who do all the right things who end up with unkind children because of the heaviness of past karma. Results don’t ripen instantly, so it is possible to be an excellent parent but still experience a less than excellent child! Some unkind parents end up with amazing, positive children. As a parent, I try to create the conditions whereby my children can thrive, and I try to show by example how to be kind, helpful, open, generous, etc. Sometimes I succeed in those areas, sometimes not. My job as a parent is to help my children develop their positive qualities and lessen their negative qualities. But the success is defined by the presence of positive qualities in my own mind as I try to help them grow. Diane Rowley: Diane spent her childhood years on a farm in Montana, one of seven children. She and her husband moved to Portland in 1985 and became involved in the Waldorf community where their children attended school. 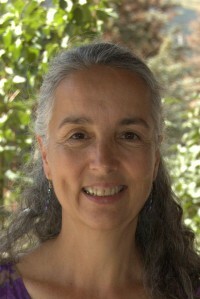 She is the pedagogical administrator at Portland Waldorf School, parent educator, former early childhood teacher and mother of three young adult children. Diane Rowley: It is helpful to recognize that the undertaking of parenting brings with it inevitable challenges and joys. Success is when you meet those challenges and joys with consciousness, striving and love. As parents, we are called upon to look beyond the physical, to see beyond the being, to the spirit of the being. As human beings we are here to develop certain capacities, and challenges help us to develop and discover these capacities and fulfill our purpose for being here. As parents, we have the opportunity to assist another being in developing their capacities and in the process often confront our own inner challenges. Success is cultivating an atmosphere in which your child can learn to listen to their inner spirit and connect with their purpose. In striving to understand them and appreciating their differences, we can cultivate observational skills and openness to all beings. It is important to develop trust in our own worth and the worth of others. Success is helping your child feel and know their own worth. Mica Carew: I believe that having a rhythm in daily life activity includes a rhythm with daily practice of meditation and mantras. My daughter is three years old and I am pretty sure that she is learning by example. One of the things that our daughter can count on is that first thing in the morning, a candle will be lit and meditation will happen even, if it’s for a minute. She has the choice to join us or play in the same room while we set the daily rhythm. It’s like setting the tone for the day. The same goes for the evening time. She can count on nightly mantras before bedtime. I think it helps to create a feeling of confidence and stability for our child and for our whole family. Mica Carew: Mica is a naturopath, acupuncturist, qi gong teacher and yoga practitioner. 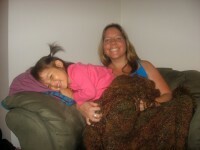 Mother of a 3-year-old, Mica is dedicated to her family and bringing spiritual practice into every aspect of her life. Our family has a code word now for when one of us needs to get centered: “Hey, go to the mat.” This means: pretend you’re back on the meditation pillow and breathe. So for us, the setting of the tone of the day with meditation and closing the day with mantras doesn’t really end after those two tasks are done. It then blends into daily life and carries though dreamtime and then to the morning hours when we will be back at the pillow (mat) to start our rhythm again. For me, success in the “job” of parenting means showing minute by minute how one can bring mindfulness and spiritual practice into daily activities. Most importantly, I believe a successful parent is not taking yourself and tense situations too seriously. I try to find one humorous thing in stressful situations. How do you balance the “full-time job” of being a parent with employment outside the home and taking care of yourself? Diana: It is sometimes helpful to start with the practical day to day aspects of life with children: when you feed them, feed yourself; when they nap, you nap – take time to bask in simple moments of what brings you joy. Seek to transform your attitude toward daily tasks. Cultivate an inner gesture of loving service, an inner attitude of appreciation for all things. It is possible to find joy in even the small mundane tasks if you see your “job” as one of loving service. Create good habits for yourself and your child. Strong rhythms and consistency are essential … make sure there is a predictable time for mealtime, bedtime, etc. Rhythm is strength! It can be helpful to have a set day for needed activities like washing clothes and cleaning the house; involve your child in taking care of these daily tasks. Don’t beat yourself up … there is no such thing as perfect or the right way to be a parent. Anxiety about doing things right can leak out and negatively affect the home atmosphere. Strive for cheerfulness, humor and positivity. Take time to be at rest, even if it is just for a moment. Notice your breathing. Notice the sun on your child’s hair. Notice the smell of a flower. Trade a day of parenting with a friend by taking care of their child one day a week and let your child visit theirs on another. Give yourself “small vacations” even if it only half a day. Pamper yourself once in awhile, whatever that means to you. Mica: My mom always told me put your spiritual practice first above all else and everything else will follow its lead. I really didn’t know what the big deal about that statement was until I had a child. For my husband and me, it was imperative to be part of a sangha. Our time became much more limited and we needed to really be much more mindful of how we spent our time individually and as a family. We both wanted to continue cultivating our understanding of who we were in relationship to the world – how and why we may react and respond in relation to the outside world. This means looking at how we may have karmic patterns that are unhealthy and not serving us, our family or all beings. If there is a little time for me to look at what I may be doing when I’m at my pillow, then I can make changes internally and respond differently to my external world. I cherish and am so grateful for my Friday meditation class with my teacher. It’s like a big reset button. I know if I’m back in balance then my family will follow suit if they’re not there already. We knew that spending time with fellow Dharma practitioners and finding a community that fit us was a top priority. We also knew we needed a community that would fit for our 3-year-old as well. We found this community at Maitripa College where we feel comfortable to meditate and learn the Dharma. This is one huge way that we take care of ourselves. I work three very long days a week, as does my husband. For now, this seems doable for us. We think this works because the rhythm of the day is the same for our child, whether or not it is my husband or I who is taking care of her. We always have breakfast together. We have Saturday as our family day. On family day, everything is put aside, such as cell phones, computers, and even worries. We are 100% together. We act like every Saturday is a vacation, no matter what it is we’re doing. We soak in the family energy and fully enjoy our time together. My husband and I have yoga practices that we fit in on the days that we work. This practice helps me come back to center and keeps me physically, mentally and spiritually healthy. In addition, I am grateful that I have a job as a naturopath and acupuncturist where most of my patients are always seeking to deepen their own spiritual practices. When I choose to have my spiritual practice above all else, it helps to simplify my life. It allows me to see what is unimportant and it helps me and my family to focus on what is optimal for the well-being of the whole family and for the greater good. Carina: I bring parenting into my job; bring my job into taking care of myself; and take care of myself while parenting. Sometimes it balances, sometimes it doesn’t. Sometimes I think parenting is over “here,” spiritual practice over “there,” work somewhere else. Actually, it is all the path, all opportunities to learn and grow. Balance means using all that comes in front of me as the path. I can learn about parenting from working with my staff and coworkers, learn about my job from being a good partner, it is all part of my evolution. Taking care of myself means keeping my worldview, remembering where things come from (karma), and generating as much compassion for myself and others as possible. When that is in check, everything else follows. The sense of balance (when it comes) is a result of me actively pursuing the positive qualities in my mind: kindness, generosity, patience, etc. and trying not to use my body, speech or mind to harm anyone and rather, to benefit. Also, balance comes from listening to myself, having compassion for myself. If I feel I need a rest, I take a rest. If I feel I need to go for a walk, or go out to a meal with friends, I’ll do that. The imbalance comes when I am not listening to myself, pushing too hard, not keeping my worldview, not getting enough sleep, not taking care or having compassion for myself. How has the life of a “householder” been a benefit or obstacle to your spiritual growth? Mica: Once I got married, I realized that this was definitely the next step in my spiritual growth. Life is pretty easy when you live on your own, coming and going as you please, living in your own place, etc. The ante had been upped when I got married. Life is all about mirrors. At work, I hopefully face my mirrors on a daily basis, but then I go home. With a husband and a child, the mirrors are ever present. It’s like doing a 10-day silent retreat that never ends. With family, many other issues come up that you wouldn’t have even dreamed about. Thus, the ante was upped again. Being a householder is a perfect setup for me to continue my spiritual walking. You can’t run and you can’t hide. It’s there in front of you all the time, just asking to be worked on, to be looked at. I love it! Carina: I don’t know any other kind of life. My path is my life which is full of successes and obstacles. But, I do try to see my partner and my children as pure (therefore legitimate teachers) when possible, as teaching me what I need to learn on my path. That means the stakes are high and the risks are high because these relationships are fast paced and interactive and my worldview is challenged continually (as well as my patience and faith!). But when I have had a successful day, or week, or month, I know that the karma I’ve planted is incredibly powerful because it has been so hard and I have persevered despite the frustration and difficulty. Another benefit is that I can get a real sense for how it is to truly exchange myself with others. If I accept my role as a parent, I have the opportunity to combat selfishness on a very deep level. Basic needs such as sleeping and eating may have to be sacrificed at times. When I can do this with joy, the rewards are very profound. The limited, small, narrow minded self-existent “I” shrinks, and the new “I” is capable of encompassing another beings’ welfare, desire, hopes, fears, etc. As for obstacles, the only obstacle I really have is my own mind and the projections that are merely reflections of that. What I do with those projections is everything, therefore, I can’t generalize whether being a householder determines spiritual growth. It is a personal, individual thing. Leigh: Pregnancy, giving birth and gradually becoming a mother has been a profound transformation of my identity and one in which I have found empowerment, forgiveness, patience, surrender of deep attachments, perseverance, joy and truly selfless love. Although the “householder” is often presented in classical Buddhist teachings as a social role which is an impediment to practice, in fact for me, starting a family has been the only guaranteed daily spiritual practice I have benefitted from in years. Life as a single person or a spouse did not free me from distractions or demands on my time, creating the fortunate conditions that those renunciates unencumbered by family are said to turn towards religious study and practice. From quiet sitting moments many times a day (and night) breastfeeding, to the powerful motivation to be the best model of human behavior I can be, becoming a mother has forced me to “practice”! Diana: Becoming a parent has definitely been a benefit and instigator for spiritual growth. It has required me to recognize and learn things about my inner self that I don’t think I would have known otherwise and to seek a connection to the spiritual world to sustain my inner strength and equanimity. Having children has required me to look at and deal with my own shadow side, often mirrored by them and given me the opportunity to know what it means to hold the highest good for another human being and to honor their karmic path. How has a spiritual view influenced difficult decisions or challenges in parenting? Carina: My spiritual view is one of trying to remember two things: karma and emptiness. This means I try to keep in mind that everything I experience comes from something I did, said or thought in the past. When difficulties arise with my own children, or arise in their lives, I try to work within this worldview both in how I experience the situation and how I try to direct it. For instance, if I am having to experience a controlling child, an angry child, an aggressive child, I first have to take stock in how present these qualities are in my own mind. I can’t just say: “I’m here, I’m innocent and perfect and angry children are coming at me.” Angry children come because anger exists in my mind. So that gives me something to do about it. If I don’t like bratty children, I need to work on subduing my own inner brat first. Meanwhile, yes, I can give a child a time out, or be firm or kind as needed and try to help them out in the moment. But I can’t give up remembering that what actually causes an angry child manifesting in my world is my own angry mind. Parenting also means giving up the wish to be liked and cultivating the wish to be of MOST benefit. I have made unpopular decisions that upset my kids in the short term. If I only cared about the short term benefit, I might give in and just do what makes them seem happy in the short term. But trying to keep the long view in mind, when given the choice, I will attempt to do what is most beneficial in a situation, even if that means being unpopular with my kids for the short term. Leigh: I believe my understandings of Buddhism has enabled me to see more clearly emotional dynamics, recall that we all want to avoid suffering and find compassion, and try to elevate another’s needs above my own. I also think Buddhism has helped me to develop honesty with myself, both in honoring my own feelings and facing my faults. When we were really struggling with figuring out how our whole family could get a full night of sleep, I had to concede philosophical and emotional commitments that were becoming an obstacle to knowing our baby as a unique being and meeting the needs of my marriage and child. Diana: Because I see my child as a growing, developing spiritual being, when I see a behavior in them that is unpleasant or unacceptable, I know that this is not who they really are, and I try to hold an inner picture of their highest self so I can respond to that behavior with clarity and firmness, kindness and compassion, knowing my guidance can help them find their way to their true purpose. I think the most difficult challenge in parenting is the practice of impermanence. Ever since I had my child the quality of impermanence seems to be so ripe for me. Drink it up I say. Do not take this for granted because this, too, will pass. It’s about being with whatever is and knowing this, too, shall pass. It’s about being in the moment and not moving from that moment. It is being fully present in whatever is being presented to you. When you do this, the experience has a different quality to it. It seems to feel more spacious. It’s as though you’re just letting the “whatever is” happen and you are not attached to it. The most difficult decisions in parenting always bring me to my mat/pillow. When I meditate and come to a decision, I feel that at least it gives me comfort knowing that the decision was made from a place of a bit more mindfulness. What spiritual teachings or prayers come to mind when you are with or thinking about your child? 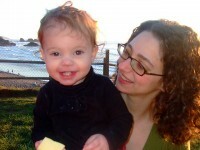 Leigh: Naturally, I wish for my child all the qualities of the enlightened beings, but in the immediate moments of the day to day, I find that putting myself into a positive and giving frame of mind has a tremendous affect on my interactions with my child and hopefully the foundations she is building. Ani Thubten Chodron’s description of Green Tara, her posture a balance of fearlessness giving in the world and imperturbable peace, has enabled me to visualize and summon compassion, confidence and endurance. Walking the lush, forested trails around Portland, the vitality pulsing in the misty greens, connects me to something similar. The two images – Tara and the green mountains – infuse my singing of the Tara mantra as a lullaby melody to my baby girl every night. For food and friends … we thank you. This story reminds me not to get caught up in my own agenda with my child. It reminds me to not get caught up wondering if I am being a good parent and doing all the right things. As a parent, I can try to set a good example and do the best that I can and set up the best conditions I am able to physically and emotionally and spiritually, and then just let go. I acknowledge that my child comes into this world with her own karma and lessons to be learned. One of our spiritual prayers that we do often, and kind of make a game of, is how many bugs (mostly ants) we can save. If we see ants that could be in danger of getting stepped on, we scoop them in one of the insect boxes that we got from FPMT and we say “om khrwcha raghana hum hri svaaha.” It’s the mantra that you say in the morning to clear karma when you may accidently step on bugs. My daughter’s favorite prayer is the Heart Sutra. We sing it in the car or wherever. It doesn’t sound anything like how we chant it at Maitripa College. It may have drum beats in it, or a “boom, chicka, boom, boom attached to it.” These are the prayers that come to mind when I think about her. I know that often times my daughter and my husband are just mirrors for my own karma ripening. When I am aware of being triggered, that my karma is coming full circle and my husband and/or child are mirroring this for me, I do the Vajrasattva prayer silently to myself on the spot. What teaching do you understand in new or different ways since becoming a parent? 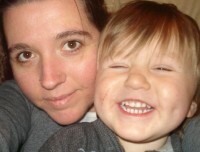 Carina: Being a parent has helped me learn how to truly serve others and how to stop serving only myself. It is relatively easy to cultivate a mind of service in reference to your own children because (typically) the attachment is so strong for them, plus they usually look like you, our favorite image! There is a real wish to benefit, to help, and there is a natural ability to access the wisdom needed to guide and protect. So the first teaching I have understood more fully through parenting is serving others. Children have an uncanny ability to push all the right buttons and to ripen various seeds that are easy to keep a lid on in the company of others. Children can not only bring out the best qualities in their parents (true generosity, kindness, protection, service, etc. ), but also have the ability to trigger the negative qualities in ways others cannot. Because of this, I can easily deduce that they are my best teachers. I wouldn’t know how many seeds I still have for anger, for jealousy, for attachment if I didn’t have children. If I was getting a nice night of sleep every night, waking up to the sounds of birds chirping, then slowing getting myself ready for the day on my terms, I might not realize how much I cherish my own tight sense of self. But! Being woken up in the middle of the night by a three-year-old yelling, demanding water or to come to bed with you, when you are so tired and just want to sleep, you see your ego RIGHT in your face. They really show me my mind, show me where I still have work to do. They are the ones who push me, who rattle me, who force me outside of my own habitual ways of thinking. And because of that, they are my best teachers. I think we have a certain image in our minds of what a lama, or a teacher looks like. We think maybe they need red robes, or they need to be from a foreign country, or speak Tibetan or BE Tibetan, or be a generation (or more) older. But a teacher is someone who can take you beyond where you are capable of taking yourself. My experience is that no one can do that for me better than my children. Leigh: Becoming a mother has gifted me glimpses of the tradition’s most celebrated states of being, experiences that help me see the incredibly profound depth of compassion, altruism and dedication the bodhisattva path describes. Probably every parent is stunned by the power of the real tong-len that can arise, for example, when you would instantly exchange your own comforts for the tormented suffering of a child in pain. Once while I was pregnant I was reciting the refuge and bodhichitta verses His Holiness the Dalai Lama has adapted from Shantideva: “As long as beings remain / As long as time remains / May I too remain / To dispel the miseries of the world.” I was suddenly overcome by the unbearable realization that, if my and my child’s lives conformed to expectations, I, the parent, would die before my child. I despaired at the thought of my child alone in the world without the strength of love and protection I already sensed that only a mother could feel. Not wanting to part from baby unless I could be absolutely certain of her immutable happiness and peace, I realized I could not fathom feeling this way spontaneously and unflinchingly towards all sentient beings. Since this experience, I have continued to deepen appreciation for the tradition’s frequent invocation of mother analogies, with gratitude for understanding phrases such as “like a mother for her only child” far beyond an intellectual level. Diana: I have learned to develop an inner trust that they will find their own way, their own purpose, with or without my help. I have also developed a strong connection with the guardian angels of each of my children and have experienced the peace that can bring. Each child brings with them their own gifts and their own stuff to work on. What they do is their own – it is not me and it is not mine. How can spiritual communities provide support to families and children? Mica: Welcome the families into the community. If the children want to meditate, hold space for them to meditate. Let the community know that children are welcome. If they are crying or making noise, let that be part of your meditation practice. Have community events that say children and families are welcome. Carina: Well, in terms of community events or teachings: welcome them! Be natural. My experience living and working within spiritual communities is that those of us who have families and young children are not the norm. Parents are aware of that and can naturally feel a little self conscious. I have shown up to teachings or events with young children in tow and received looks that would indicate I was committing some personal assault on those in attendance. This is really dangerous because it provides a condition for parents to view their spiritual community and practice as something separate from their daily lives (with their family). And I know a few parents who simply gave up their spiritual path because they felt there was no space for them to practice with a family. If you don’t have kids, go out of your way to say hello or welcome a family who does. Chances are, they feel insecure about showing up to an event and are worried that their kids are bothering you. Now, parents need to have the wisdom to know when to remove a child from a teaching or an event if they are being really disruptive, but the community should give the kids a chance. They might have more to offer than you might think on the surface and sometimes they are misbehaving because they pick up on their presence not being wanted. How can parents support the spiritual growth of their children? Diana: Being an example seems like where it all starts, providing a model for honest spiritual striving and consistent spiritual practice. Showing kindness, integrity, respect and reverence to all beings in all aspects of your life, in your feeling, thinking and doing. Mica: My parents are devout Catholics and have a strong spiritual practice. They are very gracious people and are generous in many ways to their spiritual community. They definitely taught me through example. Our spiritual practice looks different, but the essence of being a truthful, generous, mindful person is all the same. My father always says, “Let water seek its own level.” Which to me means don’t push, just be there. Be there, show by example and then let them find their way. I believe that if I maintain discipline in my own practice, on and off the pillow, my child will find her own way. Her literal practice may not look anything like her parents, but the foundation will be in place, just the same. Carina: The best support a parent can give to their child is helping them to develop a kind heart, a good heart, an open mind. The only way to do this is through developing those qualities in one’s self and showing by example. To really help anyone, you have to know how to listen and this comes from breaking down the boundaries between yourself and others and helping them as you would try to help yourself. If I approach my kids with concrete ideas of how they should be, how I want them to be, how they need to be, I am setting myself up in a binary of attachment. And thus, setting myself up to suffer because it most likely won’t go how I think it should. But if I give some space to their development, and try to approach my work with them as supportive, rather than controlling and dominating, this creates much more fertile ground for their growth. However, we can’t always see positive results of good actions right away. I might be doing the right things but not see a quick result. The time gap is what can get me: especially as an American, because we want everything fast. Leigh: His Holiness the Dalai Lama says the seeds for his understanding of compassion were planted witnessing his mother’s unwavering kindness. Waldorf and Montessori philosophies of early education also stress the learning children do through imitation of adults. I do not have much of my own parenting experience yet, but I can already see how curious she is, how precisely she can repeat, and so I strive to be aware of what I am modeling. I also rejoice in and praise all the generous, tender and joy-filled things she does.